We usually think of rabbits as cute and cuddly, but they can also be aggressive fighters, attacking each other or even us. Sadly, countless rabbits are rehomed or neglected because they are considered aggressive. The truth is that aggression can usually be rectified. Lets have a look at the most common reasons for aggression. Castrating male rabbits and spaying females is vital for many reasons, one of which is that it will help reduce aggressive behaviour, particularly towards each other. If your pet rabbit is usually friendly and suddenly becomes aggressive, suspect pain. If you are picking them up when they have a sore back or leg, for example, they may try to protect themselves. If you suspect something is hurting, get them to your rabbit-savvy vet for a full checkup straight away. Rabbits that are not used to being handled can view their owners as a threat when they try to pick them up or stroke them. They will act like they would in the wild when faced with a predator; freeze, try to run away or show aggression. A hutched rabbit has nowhere to run so may use aggression. If your rabbit is being aggressive, but you are sure they are not in pain, ask yourself whether they might be afraid of being handled, and why. Are you suddenly appearing where they didn’t expect you to be? Speak to them as you approach so as not to startle them. Always use a calm, quiet voice. Try to let your rabbits come to you rather than approaching them. Sit on the floor with some treats handy and sprinkle them near yourself, not so close that they have to touch you to get them. Do this over a period of days to build up trust so they come closer and closer and will eventually eat from your hand and ultimately be happy with you touching and stroking them. Rabbits are very active and athletic animals and a hutch is simply not enough! Being confined to a restricted area does not allow a rabbit to be a rabbit. They can not do the things they need to do – run, dig, jump, rear up or forage for example. This makes them frustrated, unhappy and often causes health problems. 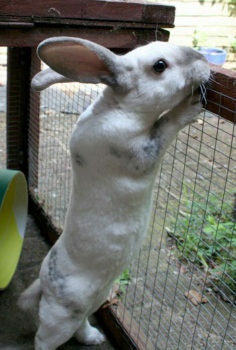 Rabbits that can not stretch up tall develop spinal deformities that are painful when they are handled, which can result in aggressive behaviour. So get their accommodation right and you’ll have happier rabbits. Some rabbits can show aggression towards their owner when a hand is placed into the hutch to fill their food bowl or to remove dirty bedding. To the rabbit this is seen as an invasion of their territory so they treat the owners hand as a threat and display territorial aggression. Again, you need to build up trust with your rabbits to prevent this. Rabbits can display aggressive behaviour towards their owners or perhaps companions during the spring – the rabbits’ natural breeding season. This aggression is hormonal and indicates a normal desire to defend their territory and ward off any rivals. This behaviour can often disappear by the end of the summer and may not reappear until the following spring. This behaviour should be reduced by neutering (males) and spaying (females). Rabbits are very social animals. Because they are prey animals they feel safer when they are with other rabbits who can help them keep a lookout for dangerous predators. Single rabbits don’t have this family group to rely on and so they are nervous and sometimes that nervousness shows as aggression. Once your rabbit is a member of a group or a pair they will feel far less lonely, less nervous and more confident, although sometimes a rabbit will be aggressive towards a human in defence of its friends! Female rabbits will follow their instincts and defend their babies. Sometimes this will happen if they have false pregnancies, build a nest, and believe they have a litter. Whether your rabbit really has kits or simply believes she has, respect her space around her nest and if she is aggressive, leave the nest alone. If your rabbit tends to be very protective of food, usually pellets, it’s probably best to remove the focus. You can do that fairly easily by not feeding pellets in a bowl. Instead, sprinkle them across the floor, or better still, hide them in the day’s supply of hay. That will encourage your rabbits to eat hay (which is far more important for a healthy bun anyway) and find the pellet bonuses scattered through it. Neuter, this will reduce the hormonal reasons for aggression. Provide correct diet. Eating hay keeps rabbits busy, frustration free and healthy. Never use punishment as a training method. In most cases of aggression, the problem worsens as soon as the owner tries to reprimand the rabbit as the owner appears threatening. Aggression when you try to pick them up? If you think this is due to fear or nervousness then try this gentle programme designed to teach your rabbit that you are not a threat. Stop trying to stroke or pick up your rabbit for a period of two weeks. In that time start to hand feed your rabbit treats and speak calmly to them. If your rabbit is now more relaxed start to stroke them whilst they are eating the treat. If your rabbit will take a treat but won’t let you stroke them, you may have to spend longer on the first stage. If your rabbit tries to bite you when you stroke them then replace your hand with a long handled brush so that the rabbit bites that instead. When the rabbit bites the brush, stop touching the rabbit until it goes back to the treat and then repeat. You are now ready to start picking your rabbit up. This should also be introduced in daily stages using treats at each level i.e. initially your rabbit can be scooped onto your lap to eat a treat.